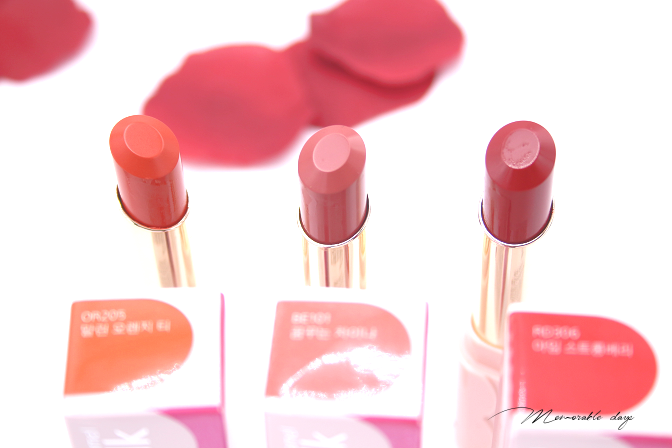 Swatches: ETUDE HOUSE Dear My Enamel Lips Talk OR205, BE101, RD306 | Memorable Days : Beauty Blog - Korean Beauty, European, American Product Reviews. Hi all! I hope you are having a lovely day. 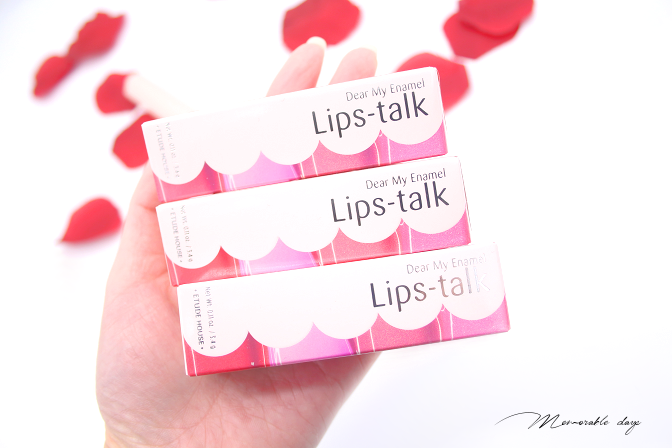 ETUDE HOUSE has re-packaged the Dear My Enamel Lips-Talk lipsticks. 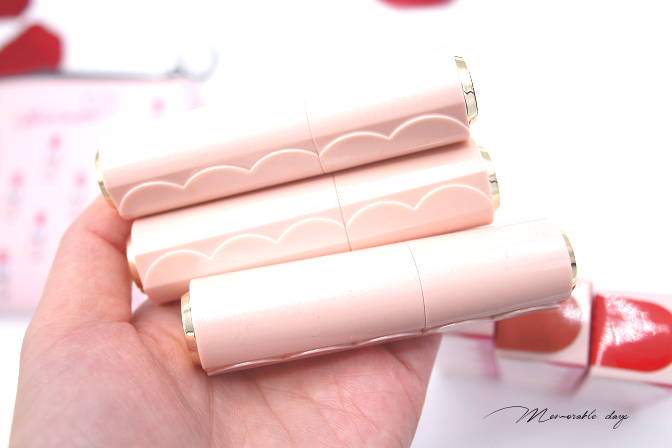 Do you still remember their Dear My Blooming Lips-Talk Chiffon lipsticks? Those are my current favourites, but the Dear My Enamel lipsticks are slightly different! 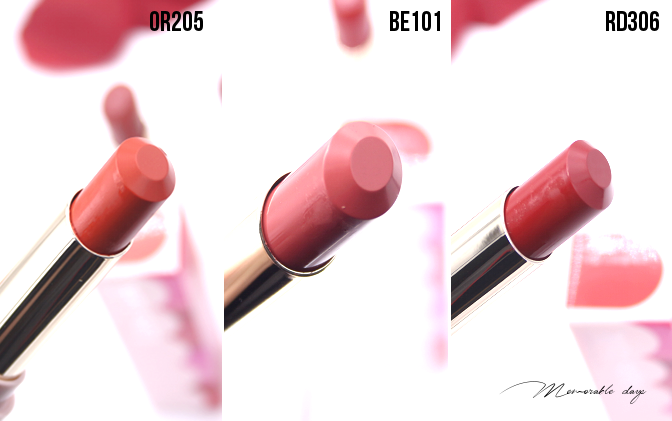 In today's blogpost I will be showing swatches of 3 shades, check it out! The packaging of the lips-talk series are very similar to each other - adorable pink plastic packaging and these ones got shimmers on it. These lipsticks include moisturizing ingredients which will keep your lips moist during the day while having a vivid color on your lips. 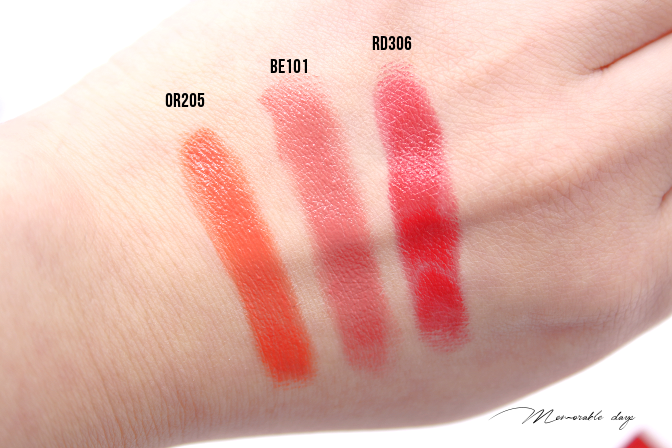 There are 19 shades available and I got the shades: OR205 (orange), BE101 (beige) and RD306 (red). OR205: Polybutene, Diisostearyl Malate, Hydrogenated Polyisobutene, Vp/Hexadecene Copolymer, Polyethylene, Microcrystalline Wax, Polyglyceryl-2 Triisostearate, Dimethicone, Polyglyceryl-2 Diisostearate, Octyldodecanol, Titanium Dioxide (Ci 77891), Hydroxyapatite, Red 22 Lake (Ci 45380), Yellow 6 Lake (Ci 15985), Iron Oxides (Ci 77491), Polyhydroxystearic Acid, Dimethicone/Vinyl Dimethicone Crosspolymer, Red 7 Lake (Ci 15850), Fragrance, Helianthus Annuus (Sunflower) Seed Oil, Prunus Armeniaca (Apricot) Kernel Oil, Honey Extract. BE101: Diisostearyl Malate, Polybutene, Hydrogenated Polyisobutene, Vp/Hexadecene Copolymer, Polyethylene, Microcrystalline Wax, Titanium Dioxide (Ci 77891), Dimethicone, Polyglyceryl-2 Diisostearate, Octyldodecanol, Hydroxyapatite, Iron Oxides (Ci 77491), Polyhydroxystearic Acid, Dimethicone/Vinyl Dimethicone Crosspolymer, Polyglyceryl-2 Triisostearate, Red 6 (Ci 15850), Fragrance, Red 7 (Ci 15850), Blue 1 Lake (Ci 42090), Helianthus Annuus (Sunflower) Seed Oil, Prunus Armeniaca (Apricot) Kernel Oil, Honey Extract. RD306: Diisostearyl Malate, Polybutene, Hydrogenated Polyisobutene, Vp/Hexadecene Copolymer, Polyethylene, Polyglyceryl-2 Triisostearate, Microcrystalline Wax, Dimethicone, Red 7 Lake (Ci 15850), Octyldodecanol, Hydroxyapatite, Polyhydroxystearic Acid, Yellow 6 Lake (Ci 15985), Dimethicone/Vinyl Dimethicone Crosspolymer, Iron Oxides (Ci 77491), Red 6 (Ci 15850), Red 22 Lake (Ci 45380), Yellow 5 Lake (Ci 19140), Fragrance, Helianthus Annuus (Sunflower) Seed Oil, Prunus Armeniaca (Apricot) Kernel Oil, Honey Extract. It doesn't stay long on the lips unfortunately. Once you drink or eat, it fades away and transfers. Re-application is always needed during the day. They all have a light sweet cherry scent to it, luckily not overwhelming and fades away after application. You won't taste it on your lips. All 3 shades are moist on the lips and won't sit in your lines and it dries to a glossy finish. It does what it claims. 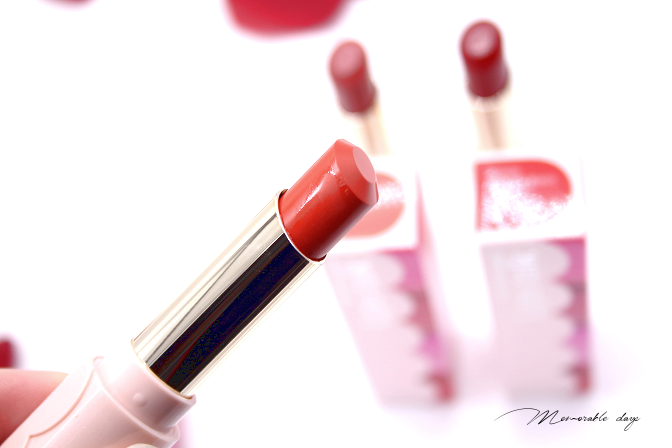 As you can see from pictures above, it has a flat tip which is easier to apply on the lips. It applies smoothly and is extremely pigmented. Because the colors are vivid and pigmented I like to apply this with a brush so I can easily build the color up. You can also layer this on top of another shade or create gradient lips if you apply it with a brush. You are able to purchase them at their official website etudehouse.com and they are sold for USD$10.08 each. 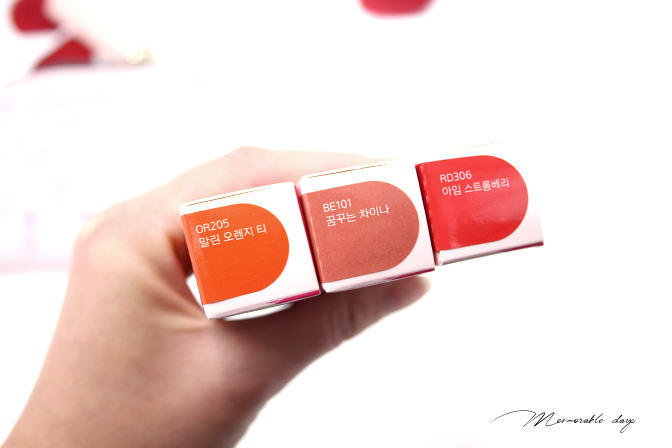 Not bad ETUDE HOUSE! I like how moist they are and the shades are pigmented. I am more of the natural colors so I like the beige shade the most. The glossy finish makes my lips looking fresh. The staying power ain't that great unfortunately, so re-application is needed. Other than that, the lipsticks are good and the price is reasonable.